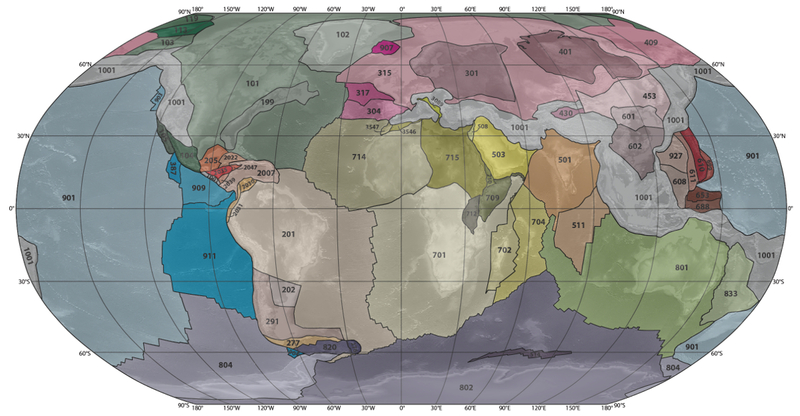 For the main continents (Africa, North America, South America, Eurasia, India, East Antarctica, Australia) we used the same rotation parameters as were used to calculate the apparent polar wander paths of Torsvik et al. (2012), Besse and Courtillot (2002), Kent and Irving (2010), and van der Voo et al. (2015) as specified in those papers. The remaining plates were added to that plate circuit as shown in Figure B using rotation parameters of Seton et al. (2012), except for the Caribbean (based on Boschman et al., 2014), NW Africa (based on van Hinsbergen et al., 2014a), Adria (based on van Hinsbergen et al., 2014b), Tarim (based on van Hinsbergen et al., 2011), and Iberia and Porcupine (based on Vissers and Meijer, 2012a, b; Vissers et al., 2013).